This charming ambrotype was thought to have been produced by one of Australia’s most important early photographers, Thomas Glaister, owning to the presence of the Glaister stamp on the case. However, superb varnish was one of Glaister’s hallmarks and this ambrotype is not varnished. In addition, the hand-colouring is not considered to be to Glaister’s standard. 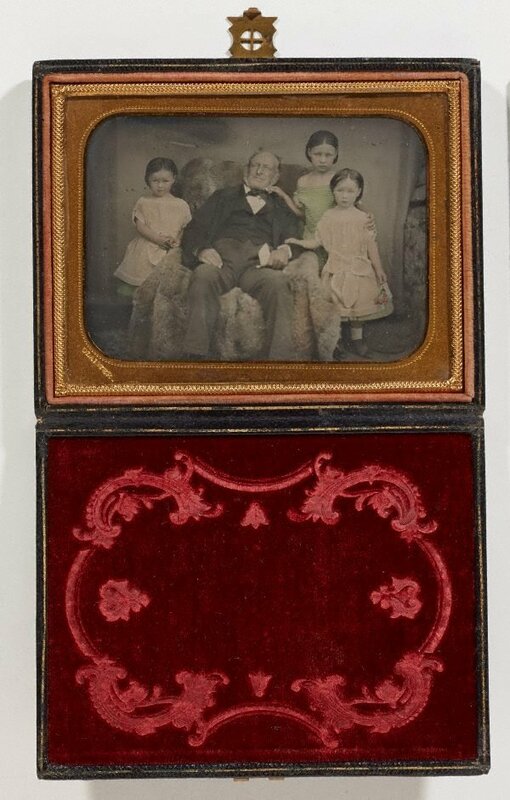 As such, it is possible that the ambrotype was inserted into this case at a later date, not least because there is no form of blackening behind the image. This was standard practice to prevent the viewer seeing through to the inside of the case. The Eichmeyer ‘book’ case, patented in 1855 by Henry A Eichmeyer of Philadelphia, were made of fine leather and beautifully put together. Glaister certainly used these but the ambrotype is probably not his specifically and could have been made by one of his sons in the 1860s when they worked as travelling photographers. Regardless of who took the image, it is a charming colonial portrait which in size is typical of the period – it can easily be held in the hand. Ambrotypes were developed in the 1850s. They were faster and cheaper to make than daguerreotypes, yet were still unique objects.